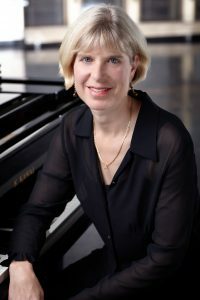 Jazz pianist and composer Nelda Swiggett is a Seattle native and University of Washington graduate. She formed her first band, the Room to Move Sextet, in 1990, and has since headlined her own group performing her original music at many of the Northwest’s top jazz venues. “… a bright palette, a sinewy execution and a powerful, assertive command… the sound is all Swiggett’s: refined and confident, open and inviting. Nelda’s four CD recordings have received frequent airplay on Seattle’s popular jazz station KNKX 88.5 and around the globe. Her melodic originals draw from a long list of influences, from jazz to Afro-Cuban, to gospel, classical and more. In 1998, her talent for composition was recognized by an Artist Trust Fellowship funded by the Washington State Arts Commission and the National Endowment for the Arts. In 2015, Nelda won SWOJO’s international Jazz Composition Contest for Women Composers, and her big band arrangement, “Cat Dreams,” was debuted with special guest guitarist Mimi Fox at Seattle’s Triple Door as part of the 2015 Earshot Jazz Festival. Nelda’s original big band arrangements have been performed by Seattle’s nationally recognized Garfield High School Jazz Band I, the Seattle Women’s Jazz Orchestra (SWOJO), and others. Nelda’s current project, the Alaska Suite: a story of beauty, loss and hope, is inspired by the impacts of climate change in Alaska, and features the emotional power of multiple mediums — a five-piece chamber jazz ensemble, spoken words, images and poetry. “I was not prepared for how the combination of an excellent jazz composition and a factual and emotional narrative about Alaskan climate change would both inform and move me. 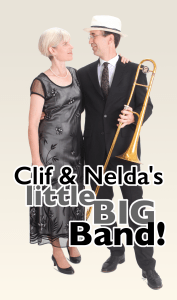 Clif & Nelda’s little BIG Band features Nelda on piano and vocals and her husband Clif Swiggett on trombone and percussion. Their duo performs classic swing and jazz standards, lively Brazilian and Afro-Cuban rhythms, and funky hits by Stevie Wonder, Pharrell Williams and more.